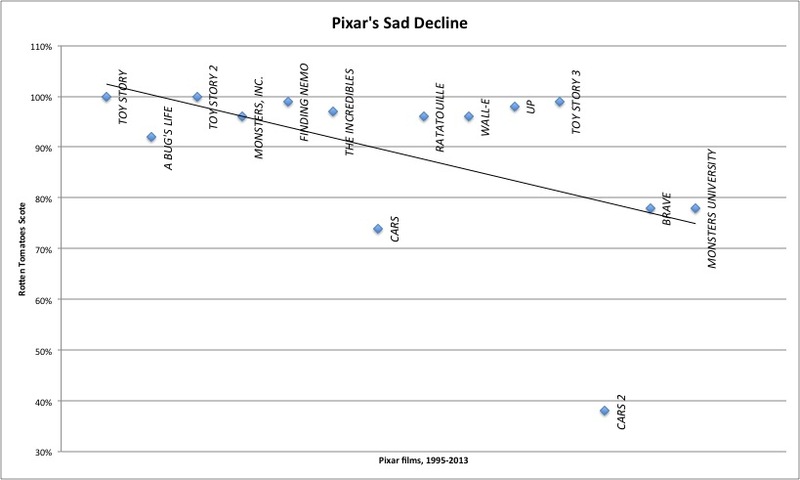 The generally “meh” critical response to the recent release, Monsters U, prompted The Atlantic to post a piece on the “sad decline” of the Pixar dynasty. Using Rotten Tomatoes approval data, Christopher Orr charts the trend toward mediocrity(though, in this market, mediocrity might be the best you can ask for). At any rate, Pixar generally produces “kids” movies, and the folks at Slate.com took the novel approach of actually asking the kids what they thought. Shockingly, it turns out that kids and the critics don’t always see eye-to-eye on movie ratings. The biggest divergence seems to be with A Bug’s Life, a charming tale of a bug’s life featuring the voices of Dave Foley, Kevin Spacey, and Denis Leary (what kid doesn’t love Denis Leary?). More than 90% of critics rated this one fresh, whilst the kids covered the screen with maters, with an approval rating in the mid-30s. In a similar vein, the critics fell all over themselves praising Finding Nemo, whereas kids were split down the middle in their approval of this mother-killing fish tale. The critics were not thrilled with Cars (just over 70% approval), but kids loved it even less (just under 50%). I’m not sure I believe those numbers, actually, given the pervasiveness of Cars stuff (though the little girl quoted in the post title does make a compelling point). I do believe the second set of numbers, however, regarding Cars 2. The critics panned this hyper-violent Bond-esquey schlock (40%), whereas more than 70% of kids gave it a fresh rating (12-year old girls notwithstanding). My boy walked out of the theater laughing about “all the guns”. Huh. 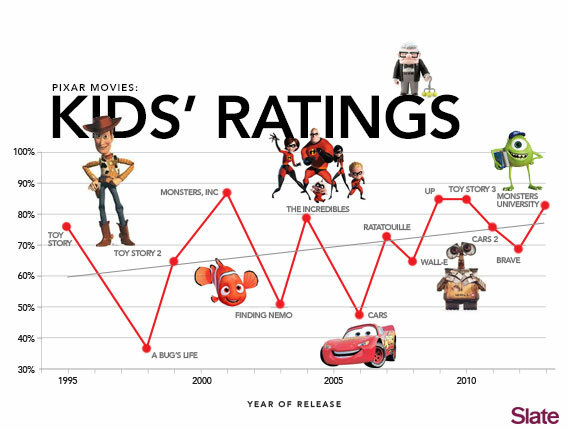 When you add it all up, the approval trend is going quite the opposite for Pixar’s appeal to kids compared to its appeal to critics, which probably has a lot to do with its “sad demise”. The Economics Department proudly presents The Informant Tuesday night at 9:30 in the Warch Campus Center Cinema. The movie “comically” recreates the character of Archer Daniels Midlands (ADM) employee, Mark Whitacre, the principal informant in the notorious lysine price fixing scandal. 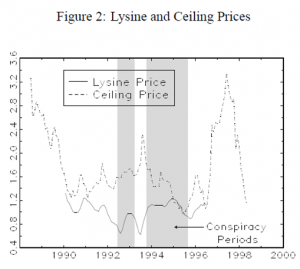 Lysine, as you probably know, is an essential amino acid used to fatten up hogs and broilers. If you mix it in with corn, you don’t have to spring for the relatively more expensive soymeal, or so I’m told. Is there a bigger champion of the educational movie on campus than Professor Brozek? I think the answer is decidedly not. In the spirit (sort of) of last year’s international film series, this term he brings us Forbidden Planet to entertain and enlighten us in ways that only sci-fi movies from the 1950s can. The movie screens Tuesday, September 21 at 9:30 p.m. in Warch Cinema. Everyone in Freshman Studies (and beyond?) is invited. Forbidden Planet is an adaptation of The Tempest set on the planet Altair IV in the year 2257 – Shakespeare in space suits, essentially. 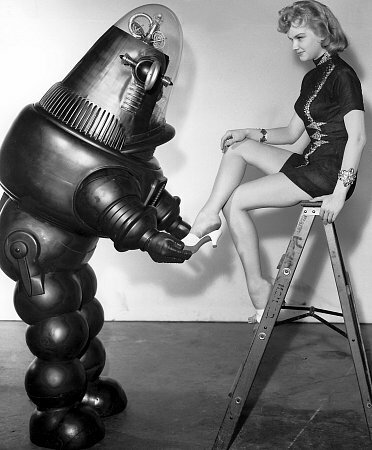 The parallels between the movie and the play are numerous – Dr. Morbius and his daughter, Altaira, are the only human inhabitants of the planet, although they have a faithful servant in Robby the Robot. When a mission from Earth comes to rescue Dr. Morbius, they discover threats (a machine that creates monsters in the crew’s subconscious) as well as romance (Altaira and a young Leslie Nielson as Commander Adams). If you’d like to read more, check out “Shakespeare in Outer Space: Forbidden Planet as Adaptation of The Tempest,” by Miguel Angel Gonzalez Campos at the University of Malaga. The target audience is Freshman Studies students, but I don’t think we’re quite that picky. See you there.